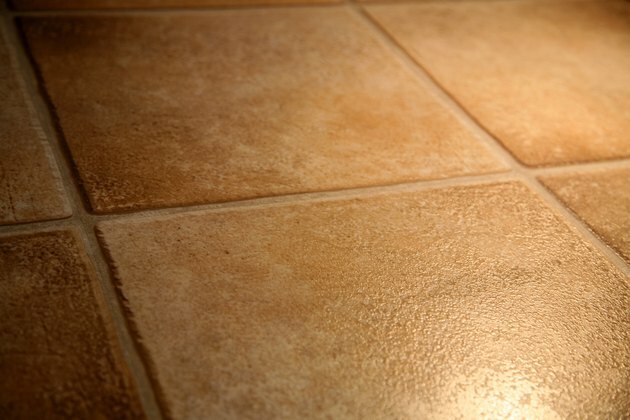 A rough tile floor can show its age when dirt and debris get ingrained in the tile's intricate design or texture. To prevent future stains and dirt buildup, lay rugs or carpet over the tile floor to prevent debris from being tracked in. Dirt acts like sandpaper to any type of flooring, so it's important to keep up a cleaning routine to prolong the life of your rough tile flooring. Sweep the tile floor to remove the dirt buildup. 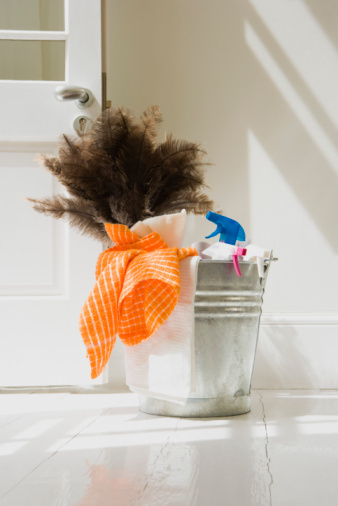 For a thorough cleaning, remove all furniture and carpeting. Mix 2 tbsp. dishwashing detergent and 1 gallon of water. Use a dishwashing detergent that is pH neutral. Dip a bristle brush in the cleaning mixture and concentrate on heavily soiled areas of the tile. Repeat the process until you see the dirt lift from the tile flooring. Rinse the floor to remove any accumulation of cleaning mixture. Wipe the tile flooring down with white towels. Allow to completely dry before buffing. Rent a floor buffing machine from your local hardware store. Purchase a white buffing pad to use on the rough tile. Buff back and forth across your flooring to get an even shine.